Up to 14 years of full body treatments or 20 years if used on lower legs, bikini, face and underarms..
Braun Silk-expert IPL provides fast treatments suitable for large body parts such as legs or arms. A leg or arm can be treated in just 8 minutes, without compromising on effectiveness. The exfoliation brush removes dead skin cells thanks to its massaging micro-vibrations that visibly improve skin's appearance by exfoliating it 4x better than a manual treatment alone. Braun Silk-expert is an IPL system which results in permanent visible hair removal in as little as four treatments. It works beneath the skin's surface by targeting the melanin in the hair follicle, helping to break the cycle of hair re-growth. With continued, regular use, it helps prevent unwanted hair from reaching the skin surface. 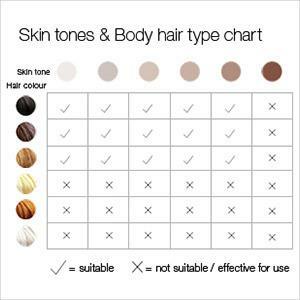 Skin tone varies across different parts of the body, with each tone requiring a specific energy level to target the melanin. Braun Silk-expert has the SensoAdapt skin tone sensor which continuously reads your skin tone – 80 x per second – and automatically adapts the light intensity for efficacy and safety. This removes the guesswork of having to match your skin tone against the complicated colour matching charts other devices require. First time users can select the gentle mode which uses a low light intensity. It is also ideal when treating sensitive areas such as the bikini line or under arms. Seven reasons to IPL at home with Braun. 1. Using Braun Silk-expert IPL results in permanent visible hair removal in as little as four weeks. 2. Braun's SensoAdapt technology tailors the IPL treatment specifically to your skin tone and it is suitable for body and face treatments. 3. It uses the same principles as professional salon IPL treatments, all in the comfort of your own home. 4. 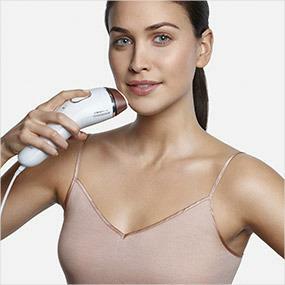 Braun Silk-expert is one of the fast IPL technologies. A leg can be treated in just 8 minutes. 5. Clinically tested by experts, treatments are gentle and virtually painless. 6. The IPL device is corded for uninterrupted treatments with maximum power. 7. Compared to professional laser or wax treatments, Braun Silk-expert IPL is an effective home hair removal method. A leg can be treated in just 8 minutes. Braun Silk-expert IPL is effective on light to medium skin tones with hair ranging from natural blonde to dark brown or black. The device is least effective on very blonde, red, grey or white hair where the small amount of melanin does not absorb the light.